This week’s Doctor Who delivered a classic, but very familiar tale of two hostile sides coming together to face a greater threat than each other. But while most of it was a story we’ve seen many times before, it stood out as a huge, satisfying step on Bill Pott’s ongoing journey as the Doctor’s student. Doctor Who has tried this same journey recently with previous companion Clara—but there was a darkness in her evolution, as she transformed from being wary into the man the Doctor had become, to trying to be like him herself and learning how difficult and bleak it can be, to how ultimately getting addicted to the danger of being around the Doctor could lead her to an untimely death. But the Twelfth Doctor himself has grown significantly in his post-Clara era, and his relationship with Bill has therefore been different in comparison. 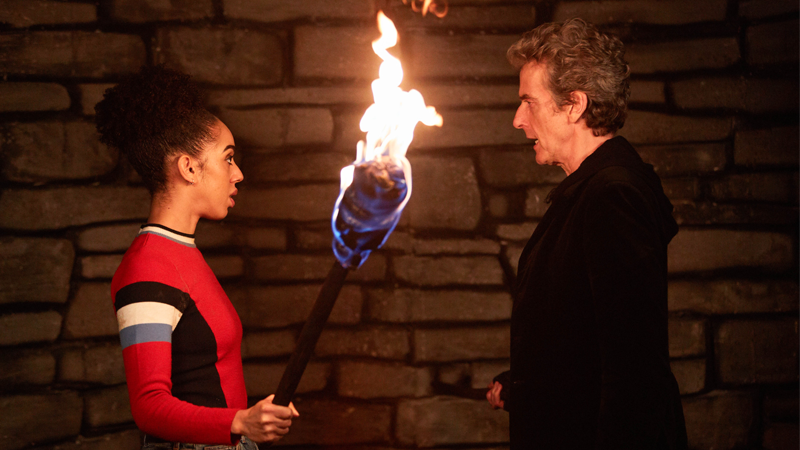 Gone is much of the bleakness surrounding the things the Doctor has to do to save the day all the time, replaced with a student/mentor relationship that, thanks to Peter Capaldi and Pearl Mackie’s exquisite chemistry, has become the highlight of season 10 so far, even when the stories they’re involved in have not quite lived up to the two stars themselves. Over the course of that relationship we’ve seen Bill face the reality of traveling through time and space, realize the sacrifices that have to be made sometimes, and most recently in the otherwise lackluster Monk trilogy, show she’s just as capable of taking matters into her own hands as she is putting faith in the Doctor. “The Eaters of Light”—the first episode of the revived version of Doctor Who to be written by a writer from the classic series, Rona Munro—is another one of those solid, if mostly forgettable adventures the Doctor has so many of. Although it built up a loving recreation of ancient Scotland, and tackled some of the grey morality behind the cruel invasion of the region by the Romans through the characters of Kar (Rebecca Benson) and Lucius (Brian Vernel), the titular creature itself is a mostly impotent threat, hardly seen from until it needed to be swiftly dealt with a little quicker than usual so the show could have a longer epilogue dealing with the Doctor’s ongoing tutelage of Missy, trying to set her on the path to becoming someone he could be friends with again. It fell back on the very classic Doctor Who trope of two warring sides coming together peacefully to face a much bigger threat, but rarely did anything to set it apart from hundreds of other Who stories that have done exactly the same thing before it. But thankfully, “The Eaters of Light” did manage to stand out in that it was the first real time we get to see Bill put into practice all the lessons she’s learned during her time with the Doctor. Although it’s still clear that she’s relatively new to all this—after all, she only just realized in this episode that the TARDIS autotranslates languages for her—her time spent in this episode mostly separated from the Doctor here allows us to see just how much stronger and more confident she’s become. The way she confidently strides off to prove the Doctor wrong about the mystery around the mission Ninth Legion, the way she rallies what’s left of the decimated Roman unit in the face of certain death (with a speech that wouldn’t have sounded out of place being uttered by the Doctor himself) and helps bring them back to safety all contrast with the Doctor and Nardole’s constant reminders to themselves that they have to “save” Bill, not quite realizing yet that she’s more than capable of saving herself. When the Doctor and Bill are finally reunited, it leads to the beautiful moment of the Doctor standing aside to let Bill inspire the Pictish tribe and the remaining Romain Legionnaires to put aside their differences to stave off the light-eating monster stalking them all—and the shared understanding that, when everyone can understand each other (metaphorically and literally, thanks to the TARDIS), the universe is filled with the sounds of children who are calling out for help. Crucially, it’s not a moment where the Doctor teaches Bill this, but lets her come to the conclusion herself: a step towards them no longer being a student and teacher, but equals. It’s an important moment for Bill’s story, but one also tinged with a hint of sadness considering the odds are there’s not much left of her time in the TARDIS. If Bill doesn’t carry on into Chris Chibnall’s new era for the show, there’s just two episodes (and potentially Christmas) left with her, meaning all the potential of Bill’s evolution from student to equal might end up being mostly untapped. But it’s still be a journey worth seeing, even if it’s not much time to be spent with Miss Potts. This episode also featured the most longwinded explanation for why Crows say “Caw!”, which is both the most ridiculous and most Doctor Who-ish thing we’ve seen this entire season. It took me a bit to realize that Lucius was played by Brian Vernel, perhaps more familiar to most of you as the extremely space-Scottish Bala-Tik from The Force Awakens. After I did, I couldn’t stop mentally affixing “TELL THAT TO KANJIKLUB!” to every one of his lines. I wonder if Missy tears will hold a special significance in the finale, given how many times we’ve seen her cry throughout this season, seemingly repentant for her past villainy. There’s a real intimacy to the epilogue between her and the Doctor, but considering’s Missy, it’s still hard to tell if all the crying Michelle Gomez has been doing is crocodile tears or an earnest step forward for Missy. Next week: Classic Mondasian Cybermen and John Simm’s Master. God, please don’t screw this two-part finale up for me, Moffat.